After the FA Cup games last weekend, a regular league match day will be played in the home country of football on Tuesday and Wednesday. Matchday 24 is on the program and accordingly turn the 20 teams in the last championship third of the season 2018/19. Especially the fight for the two Champions League starting positions behind Liverpool FC and Manchester City will be extremely exciting. Four contenders fight for the remaining two tickets. Currently in fourth place is Chelsea London, who must compete in the English week away. On Wednesday evening there will be a meeting between Bournemouth and Chelsea! The Cherries from Bournemouth can look back on an absolutely satisfying season. With currently 30 points, the Elf of head coach Eddie Howe ranks and may ideally – depending on the outcome of the two cup competitions – even make hopes for an international starting position. Rank seven is only three meters away. The Blues from London have let feathers after a strong start to the season and now 13 points behind the table top. Meanwhile, the hosts must be directed backwards; City rivals Arsenal and Manchester United are only three points away. Attackers against teams like the Cherries should be avoided at all costs. In the game between Bournemouth and Chelsea, the odds for the away win at a 1.70! The start of the Vitality Stadium is on Wednesday at 20:45. Eddie Howe is now 41 years old and has been head coach of AFC Bournemouth for more than six years. Visually, Howe could be estimated at mid-20. The young coach is one of the hottest coaching stocks in England and represents the new, young generation – well-known in Germany as a “laptop coach”. Howe is considered a tactical genius who has developed from a small club an established Premier League representative. Again and again he has been associated with larger clubs, but so far he holds loyalty to Bournemouth. Qualifying for Europe would be the culmination of his outstanding work. In recent weeks, it ran for the Cherries but only to a limited extent as desired. After 20 points from the first ten league games Bournemouth has collected only ten points in the last 13 league games. Three wins, one draw and nine defeats are clear evidence of the weak form in recent weeks. After all, Bournemouth celebrated in the last league game a 2-0 home win against West Ham United and thus could maintain the connection to the international starting places. However, for these dreams to be realistic, the Howe team must return to the form at the start of the season. Hope for the duel with the blues is the fact that all three wins – in the last 13 games – were retracted at each Vitality Stadium. The home record is absolutely positive with six wins, three draws and three defeats. Only against Manchester United (1: 2), Arsenal London (1: 2) and Liverpool FC (0: 4) Bournemouth could not score at home. The home games against Manchester City and Tottenham are still pending, accordingly, the Cherries against the top teams at home are still without point win. Should this series come to an end, the odds of 1 / X in the game between Bournemouth and Chelsea will be over 2.00. In terms of personnel, the Howe team must continue to do without the long-term injured Lewis Cook and captain Simon Francis (both cruciate ligament tears) after an eleven-day break. Newcomer Dominic Solanke is still in trouble and has to wait for his debut. This could be another new addition. Welsh international Chris Mepham (21) was recently signed by Brentford for 14 million euros. A shape curve pointing downwards has Chelsea as well. At the beginning of the season, the euphoria was huge and on the island was predicted a three-way battle for the title. However, Chelsea are now a long way from the top and will play no role in the fight for the title win. 13 points behind will not catch up. The concentration is the qualification for the premier class, another year in the Europa League want to avoid the blues in any case. In the last Premier League game, it missed the Sarri-Elf to secure this fourth place. In the big city derby against Arsenal, Chelsea lost 2-0. For Chelsea, this already meant the third point loss in the recent six Premier League games. After the defeat against the Gunners, the Italian head coach spoke his superstar Eden Hazard Leaderqualitäten. However, this was not meant as a criticism, but rather he sees the Belgian currently as a strong individualist who can make the difference at any time, but as no player who can pull a troubled team out of the hole. After the defeat against Arsenal Chelsea, however, showed the correct reaction and kept both the League Cup and in the FA Cup the title chance alive. In the League Cup Chelsea retained on penalties against local rivals Tottenham the upper hand in the FA Cup second division Sheffield Wednesday was no problem. The away record in the current Premier League season is absolutely positive with seven wins, one draw and three defeats. Above all, the defensive knows how to convince with only ten goals conceded. With the self-confidence of the two victories and this good away record in the back a blues victory on Wednesday night is quite likely. In the game between Bournemouth and Chelsea are offered for the tip on the away win odds just under 1.70. It will be the first time in the Chelsea jersey newcomer Gonzalo Higuain to see. “Il Pipita” knows Sarri well from the time of Napoli and really thrived there. The brawny attacker is made with his body for the Premier League and is certainly a reinforcement dar. The times in which Hazard constantly had to act as a “fake nine” will be a thing of the past. A start-up assignment by Higuain is on Wednesday but not yet secured. 13 games – nine since the start of the 2015/16 season – between AFC Bournemouth and Chelsea have been played so far, there was no draw in any of these 13 duels. The Cherries from Bournemouth celebrated so far three wins, the remaining ten games ended with a win for the blues from London. However, it is interesting to note that Bournemouth has won two of its four appearances at Stamford Bridge since the Premier League promotion (2015/16 and 2017/18). In the first leg of the current season (2: 0) and in the quarterfinals of the Carabao League Cup (1-0), the Sarri-Elf prevailed without conceding. In addition, Chelsea has won the three previous Premier League games at Vitality Stadium against Bournemouth. Tactic Fox Eddie Howe has to prove his skills on Wednesday night. In the first two games of the season, he found no means against Chelsea under head coach Maurizio Sarri. This time, however, the Cherries are at home, but success would be a surprise. Finally, all three previous home games were lost in the Premier League against the Blues. The current form is maximum despite the recent victory against West Ham United to call average. All three home defeats put it against top six teams for the Cherries! Chelsea have already celebrated two wins against Bournemouth this season! All three Premier League games at Vitality Stadium have won Chelsea! The guests from London absolutely need the victory in the fight for the premier class. The last third of the season promises so much tension and point losses against the supposedly “small” teams hurt twice. Chelsea have a good away record and have recently gained confidence with two Cup victories. In the duel Bournemouth against Chelsea is a tip on the guest victory certainly obvious. 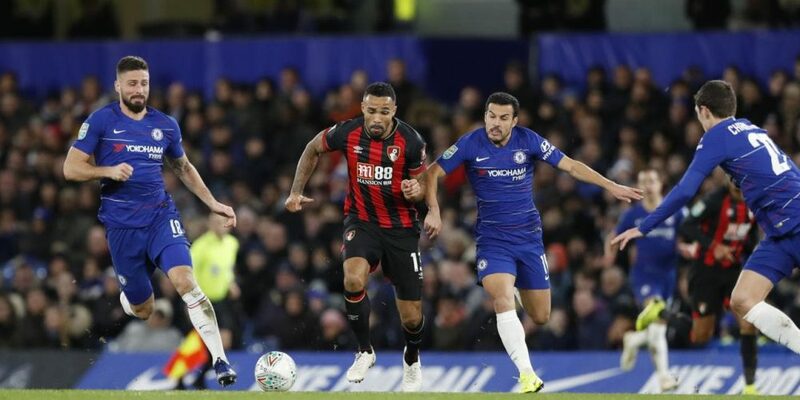 Qualitatively, the Blues are much stronger, the memories of the Vitality Stadium are excellent and Bournemouth are still at home against the top teams without a point win.